I choose to work as a mixed media artist because I am drawn to many techniques and processes, unable to limit myself to just one material or media. Reflecting upon my art origins as a contemporary quiltmaker, I can see that the use of various kinds of fabric, stitching and appliqueing was the foundation for the way in which I now work. I have come to realize that materials and processes are what drive my artmaking, along with beginning with a concept or specific image. It is important to me to create work where the “materials match the meaning”. With this in mind I select materials for their ability to help communicate my ideas. Transparent materials and glazes allow me to layer shape and imagery creating a sense of depth, history or what I like to call “soul”. 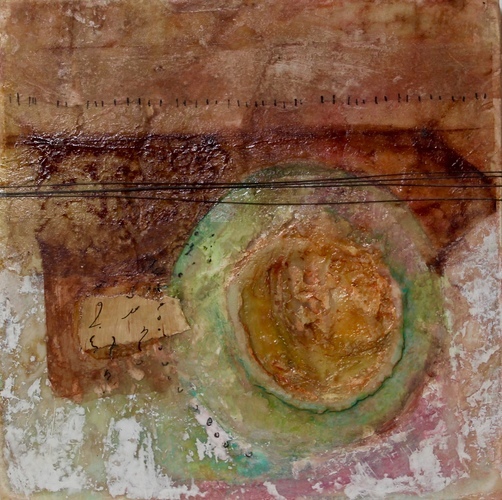 The use of encaustic medium adds a sense of mystery and luminosity to a surface. The objects and imagery that are incorporated need to evoke ideas and concepts, for me as well as the viewer. It is my hope that the combination of materials and imagery affect the content of the work making it both personal and universal. When I work with traditional materials I want to use them in a way that provides a fresh perspective on the ability of those materials to convey information. When I work with more nontraditional materials I want the message to be assessable without the use of unusual materials overwhelming the concept. Working with these objectives in mind is often a creative balancing act.